Lance Giroux, a graduate of West Point, has been serving organizations, government agencies, universities, schools and individuals since the mid-1970's. His focus is personal and professional effectiveness, leadership, teamwork and the human potential. Follow Lance on Twitter and Facebook. Visit www.lancegiroux.com. 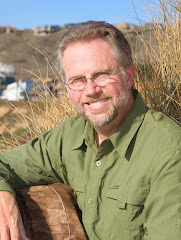 His work includes: The Art of Practice, The Mental Game, Leadership - Our Most Pressing Need, Rising Above Conflict. On July 25th I replied to a Facebook post from Irina Ruseva, Bulgarian born, who prefers being known as "European". We met years ago, first in the Netherlands and then in Egypt. Irina's post addressed her concerns about the dangers of nationalism and hate speak - and how such, regardless of country origin, have led to the great wars that have devastated our planet again and again. I agree with her. And while I may take "heat" from some friends who could label me this way or that because I feel the outrageous negative rhetoric of the day is actually causing harm rather than anything good, I have to break silence and say "enough"! I know my training and service years past as a soldier, some of which involved best methods for psychological warfare. I know the indicators, impact and traps of PTSD, and the same when it comes to segregated social structures, religious intolerance and dispersions cast at those who are members of the "opposing political party" (I've been a member of more than two), and how all of this impacts family, community and country. How do I "know"? I've personally lived it from the inside. Fortunately, I've been able to repeatedly crisscross our country and travel extensively outside it - time and again to the interiors of UK, Netherlands, Egypt, Malaysia, Indonesia, Russia, Taiwan, Japan, PR China, Australia, Poland, Mexico, Canada, with visits in Greece, Crete, Germany, Hungary, Italy, and Slovakia - to connect & converse with thousands of average people from over a hundred nations - virtually all religions and no religions and various political leanings and sexual orientations, and people doing time in prison for capital crimes to bootlegging cigarettes, and people who have been severely hurt by others. Sure there are "bad people" and I've met some. The world is dangerous. When has it not been? But I learned we best not broad brush people as "inherently evil" because of where they live or are trying to escape from, or where they were born or language they speak or don't speak, or the books they read or don't read. There are perpetrators and peace lovers everywhere. I've learned to not whole hog buy into someone else's fevered fervor because a crowd cheers loudly. Maybe this learning, this kind of being educated, means I've become blinded by study and research and critical thinking and asking questions and taking the time to listen carefully though to answers regardless of whether or not they fit a quick-fix sound bite for the day? But I say, better is this "broadly & personally informed blind" than to become "infomercially blind." My response to Irina ---> "Let us hope that average people across borders and around the world continue to speak WITH each other - dialogue to understand and know each other. We have the means today through social media and instant text to talk person to person, and people to people around the globe, and we have the ability to know ourselves and similarities shared with others - also around the globe. It's a practice we have to continue and increase and sift through - and we must be willing to say "NO" to the voices of fear and hate that otherwise divide for some under the guise of sustaining the illusion of gain. Be well Irina Ruseva. I vividly remember the conversations we had in the sun and breezes of Egypt some years ago." Special is the First Snow. For it we wait, we hope. Like romance when it arrives, the first snow lingers a short while. It speaks and reminds: nothing you do can control me. It touches what's sentimental. It can be gleeful. It can be sad. Transient. It is here. It is gone. A harbinger, it speaks. Riding the rails north to Nagoya. This train, blunt faced, striped orange on white, rumbles north and east from Shingu Station, Wakayama Prefecture. I leave behind crystal blue sky and cotton clouds hovering above the lone woman who was packing things behind her bicycle. Next to her was the station's brown poignant statue - a man holding a small child's hand. I ride the same track that two days ago carried me in the opposite direction. It's time to "come home" and be again with Fumio and Miyuki. Today's trip will last an hour less thanks than the one I took the day before yesterday, this thanks to a quick turnaround in Nagoya station where I'll catch a sleek needle-nosed, blue and white bullet train that will zip me at 200mph into Nakatsugawa. As I did when entering Shingu, I sit today on the right side of this coach now departing. The journey south treated me to lush green mountains and valleys at a distance across the spreading rice fields. This journey north will provide a close up picturesque coastline surrounded by green knobbed hills. Fishing village bays and ocean views are mine now. The seat that holds me is a four-shoulder-width distance from where I sat on Tuesday. The opposing perspectives propose two different worlds rushing past the windows. This was a forty-hour compression of life: gracious strangers meeting and taking care of me. We visited sacred shrines, one splashed orange and the other hidden deep within a mountain forest; we took a long drive upriver and walked trails to a spot held special by the founder of Aikido. We enjoyed conversations over shushi and coffee and tea; we studied Aikido under the direction of a true aikido Shihan (master) - Motomichi Anno Sensei. These can become chapters to appear on some future day - except today requires mention of Anno Sensei. When I first encountered this man, it was some years ago inside the Santa Cruz Civic Auditorium of Northern California. Surrounded by two hundred students, he stood and taught for hours, a slight body magnified by an expansive venue and a PA system that carried and caressed his energy outward into the hallways. His lessons were translated into English by his host,Linda Holiday Sensei, long-time loyal and devoted student. But yesterday, Wednesday, November 25, the scene was quite different. Alone he sat within his tiny dojo across the river from Shingo. Why? Because this is his school. He is here to teach his regular 7 a.m. class. Today his energy focuses on five of us, the morning's entire population. His first act is one of humility: a request, actually a demand, that we students sit forward of him ... quite the opposite of what traditional etiquette asks. He deeply understands that rank is something to be earned, not something to be used to lord over others. He knows who he is. He respects who we are. It was a rigorous and hard two hours of training for me, especially so because I was on the same tatami just ten hours ago under the direction of one of his senior students. My knees are not the best knees in the world, and neither is my left hip. But my purpose is to train, and train I did. Within ten minutes my knees ached, my hip throbbed. Fifteen minutes later a large blister appeared and broke under my big toe. No problem. After class I sat and thanked him with a small gift. Tim Detmer, seasoned sensei in his own right, provided the go between language-work so we could converse. Then, photo taken, we hugged and said goodbye. I moved to the small kitchen area, now a dressing room, to change from hakama and dogi to street clothes.. Outside we few passed Anno Sensei and thanked him again while he stood trimming shrubs that framed stairs leading to his school's front door. It was a delightful sight. He appeared a mixture of Star Wars' Yoda and The Karate Kid's Mr. Miyagi. Across the parking lot the student who provided my morning ride handed me a packet and said, "Sensei asked me to give you this gift as an expression of his thanks." As of this writing I'm not yet ready to share what the packet contained, except to say that it is both mind blowing and humbling. Fumio and Miyuki Mori stand on the other side of the station entry gate. We're the same age but I feel like a child. There's something magical and youthful about stepping off a train to see smiling faces, people waiting with welcome. It happened once before in my life. I was 20 years old then, arriving by train into Ridgefield, Connecticut from New York City. I will never forget that day, that sight and the cousins who, flowers in hand, welcomed me. Today is Thanksgiving Day. Fumio and Miyuki lived in the USA for a while. It's where we met and began our friendship over thirty years ago. Now they live in Japan, and it's because of them that I am here. They understand American Thanksgiving and have planned two meals - one at a restaurant and the other at their home. My mentor, George Leonard died. A few weeks prior to George's passing Fumio came to the US, stayed at my home and attended a Samurai Game that I led which would be the last that George would witness. In the days that followed we began to discuss its potential for Japan. "You need to bring this to Japan," he suggested. "We just have to find the right time." My reply, "Yes, perhaps ... but do you think it will be accepted there? I'm Gaigin (foreigner). Will people feel respected, or will they be offended? Will they think me presumptuous by bringing it?" His reply then, and in the years that followed were always reassuring, "I think it will be good. I like it. I think others will too. Someday we shall see." A date was set, November 28-29, 2015. The venue could well have been as past venues were: hotel, seminar training room, beach, school yard, college assembly hall, gymnasium. Not so with Fumio, not so for Japan's first. Here it is Kenchuji Temple, built in 1651 to honor Tokugawa Ieyasu, the first shogun of the Tokugawa shogunate that governed Japan for 268 years. It's Thanksgiving Day plus one, and Japan Samurai Game-day minus one. In preparation for tomorrow we take a drive to visit nearby Nakasendo Magome-Juku - a village strategically sitting at the confluence of ancient roads that for centuries were used by daimyo traveling to Edo (now Tokyo) to pay homage to the shogun. Here in Magome-Juku they rested. We walk the village cobblestone street and view the buildings, required preserved as they once were hundreds of years ago. We visit shops and museums and view the ancient armor of lords long past. We take a warm lunch. We sip hot tea. Hours pass. The air chills. Fumio says, "It's time to go, but first let's drive up onto that hill." And we do. The road is not really suited for us. No matter, no sense in turning back, we park, we get out. We walk among stone monuments - some obviously ancient - all with kanji (written language) chiseled. Fumio reads and informs that the inscriptions declare we are standing on the campground of a famous daimyo - the place where he gathered his strength before heading into a final battle that would prove decisive and shape the history of Japan. The chilled air becomes a frigid wispy white. Clouds quickly descend and cover the surrounding mountains, where only a short while ago the sun shone bright. "Ah," says Fumio. "It's our First Snow!" April 17-18, 2016. Samurai Game #2 in Japan. Kenchuji Temple, Nagoya. Thank you Fumio and Miyuki Mori. My first Shenzhen visit was October 1986. Relatively vacant and flat, it was a fishing town located within the newly decreed so-called "Special Economic Zone." We landed in Hong Kong a few days earlier and then traveled by bus and crossed a small simple border station building to lunch at a hotel restaurant. Across the waters more "town" was visible. Skies were blue. The air was fresh. Inside the hotel sat samples from the Terracotta Army displayed for foreigners (us) to admire. Bicycles and three-wheelers were the norm in those days. Twenty-nine years have passed. How many China visits and names of all the cities visited? I can't say. But as for Shenzhen, in place of the fishing village sits towering offices skyscrapers (mid-range / thirty floors), shopping centers and residential buildings, theaters, sports centers, and banks, banks, banks. Construction is constant. A million cars and trucks (my guess) replace the bikes and trikes, now rarities. Eighteen million people (fact) live within this one large spot. Here ... Shenzhen ... only a part of China, immersed in the largest capitalist and market driven experiment the world has ever known. It runs day and night, full force countrywide. Eight hundred thirty three miles north and east of Shenzhen rests Chengdu, home of the giant panda. Administratively, fourteen million (people not panda) live here tucked against Longmen Mountain and the Qionglai Mountains that rise above central Sichuan province. My first visit to Chengdu - January 2014. No prior reference points: only the towers of 2014 attesting to modernity. Over half of the world's Fortune 500 companies host offices in Chengdu. Mixed into the swirl of humanity are disenfranchised Tibetans - contained, my description, by the energy of watching eyes: a government that wonders what would happen ... if ... if... if.... Chengdu - the birthplace of the world's first ever widely used paper currency. Two hours forty minutes (current flight standards) due west of Chengdu sits coastal Wenzhou. My visits: by now a few; with the first being August 2007. I recall from that time. Grey. Industrialized. Flat. Hot. Stale. During the entire trip I saw only one star (actually, a planet). One striking '07 memory: a lone woman gawked and laughed as she peddled past me on her bicycle. Me, a strange-looking foreign outsider. My experiences of that visit were recorded in a poetic piece "This IS China". This is China. Yes, so are the other cities I've been to over the past few months - Beijing, Shanghai, Haining, etc. But this IS China. Large, urban, constantly moving. Not "getting ready for the Olympics". Gritty city China. Right now the sun is a large hot smog-screened ball burning through the haze scorching the skin. I don't know it, the scorch, but I feel it. What do I notice? Old men and women ... maybe not as old as they look ... walking underneath the freeway (I don't think it's called "freeway" here) scavenging wood into pots and bowls. And I wonder, what will become of the wood? What will become of them? Probably, the same thing. What do I notice? A man peddling a three-wheeled awning covered taxi cab (they are everywhere) and placing his right foot on a break attached to the frame above the front tire. After "star gazing" I went to a teahouse. Taken there by two of the students from the Samurai (Warrior) Game. Both are business owners. Wenzhou is a business/manufacturing center in China. The teahouse was a magnificent and quiet place (and very un-Chinese) filled with valuable artifacts from all over Tibet. All for sale, and some items priced as high as US$12,000. The place is owned by a woman and a guy. He's a devout Buddhist. See comment above about "Higher Power". We talked about peace. I see what I get to see, when I get to see it and enjoyed the moment. An interesting trip. Too bad it had to end so soon. My last visit Wenzhou, 2013. Susan Hammond joined me to successfully deliver our aikido-based program, The Art of Practice: an interesting undertaking considering the anti-Japanese sentiment within China. Wenzhou, 2013, architecturally magnificent, with structures towering above the above, making for a skyline unrecognizable these six years later. Look here, look there: Bentley - Porsche- Rolls Royce - Lamborghini. And then: Mercedes and Audi all so commonplace as to be, well, prosaic. And then: Buick, Buick, Buick. 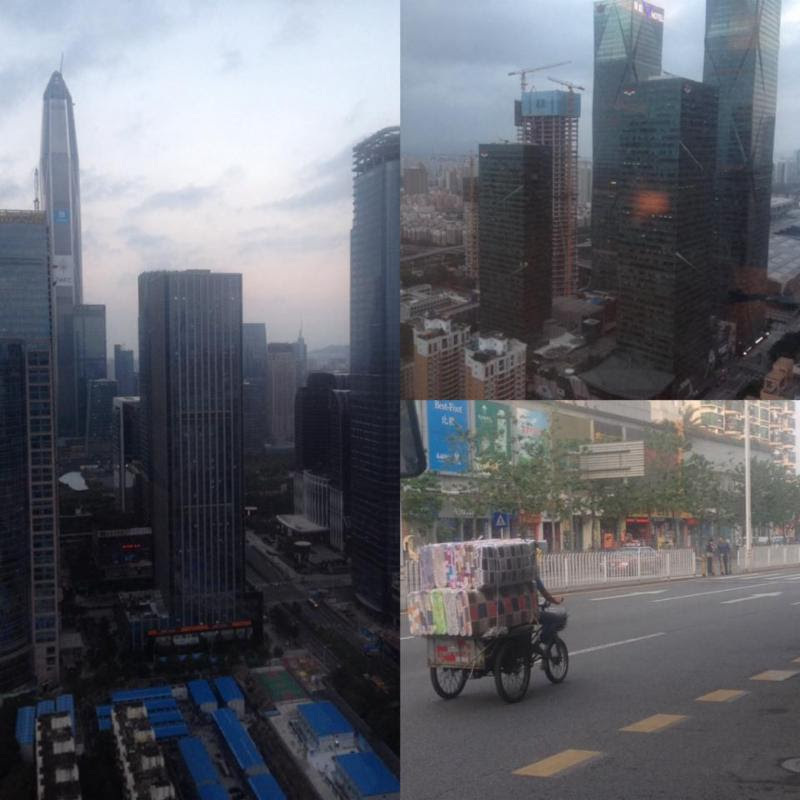 From where the now-time Shenzhen and China have come in three decades is both breathtaking and breath taking. On one hand - inspiring: people magnificently transforming a region in such a short amount of time. On the other hand - disturbing: a rampant smog here in Shenzhen today is elsewhere, everywhere everyday. There's always more than one side to every coin. Hard to imagine the "was" of 1986, when our plane landed between the buildings of downtown Hong Kong - entry point to Shenzhen. Today's Hong Kong airport outclasses most of the worlds. Yes, Hong Kong retains its decades old Star Ferry, but the buildings and those of Kowloon and the expansive stretch of the "Special Economic Zone" with new cities, e.g. ShaTin, these define the physicality of "transformation". Today most outsiders (including friends at home) have no experienced "real" clue about this place ... only clothing tags boasting "Made in China", with newsprint and talking heads proclaiming "the world's second largest economy." Ask an average person on the street in Shenzhen, "Who is Obama? ", and you'll get an accurate answer. Ask an average American on the street, "Who is Xi Jinping? ", and you'll probably get the same answer as if you asked, "Who is Ashton Carter?" Well maybe. To the latter question, instead of hearing "I don't know", you might catch "Jimmy Carter's brother(?)" - not "Secretary of Defense". What is this China? Where is it going? Who knows. Yes, problems loom, including some with serious health and medical implications that could possibly strain and drain the massive economic machine it's grown to become. But the answer to the "where" question is: We shall see. One thing for certain, China 2015 is anything but static. I'm sitting in a railway station. Got a ticket to my destination. And ev'ry stop is neatly planned for a poet and a one-man band. It's the last days of October 2015. Hong Kong and Shenzhen. Been here a while. Tomorrow I'll head home. Then back here in two weeks and on to Tokyo, Nakatsugawa and Nagoya. The series of stop-and-go's before (this current round) ended three weeks ago. Feels like yesterday, but it wasn't; Russia's Moscow and from there on to Italy's Tuscany region. Wonderful places. More importantly: wonderful people. A plus is something I've loved doing ever since I was seven years old and was bit by the "I get to fly in an airplane!" bug: the watching out of airplane windows at our planet rushing by below. Three weeks ago were breathtaking views of the Alps standing between Italy's Pisa and Germany's Munich. "Forty one years." This was my response last night. Someone I had been chatting with here in Hong Kong asked the question, "How long has this journey of yours been?" On almost every trip I can depend on hearing that question multiple times coupled with, "And where do you live?" Since 1989 my answer to that latter ("where") inquiry has been, "Petaluma. A cute little house in a small farming town in Sonoma County California." A short while back, though, and I can't remember exactly how long ago that short while was, a hesitation surfaced in my reply. I paused, then smiled and offered up my standard response anyway. The hesitation, the quiet truth, the whispered voice (loud and clear) inside me, "Oh no you don't live in Petaluma; you live in Mexico City and Beijing, Shanghai and Amsterdam, Chengdu and Shenzhen and Taipei, Oklahoma City and Guadalajara, Toronto and Wenzhou, Valle de Bravo and the Coyoacan and Hong Kong, Rostov-on-Don and Tyumen and Moscow and Togliatti ... and, and ... and now and then you visit Petaluma." That inside voice is important. It talks to me a lot. Sometimes I don't want to hear it. Sometimes I need to hear it. It's in all of us. So ... the time has arrived to begin a long journey back home ... home. Home where three very old huge oaks stand outside my front door. Home where a rose garden graces the ground out back. Home where Velasco's is a short evening walk, where owner Teri chats with her customers as she oversees American-style Mexican tacos ... not the same as Coyoacan tacos, but none-the-less tasty. Home where Japan's deep undercurrents encounter western world-ers practicing inside Two Rock Aikido dojo ... my refuge and my learning place and where I enjoy friends. Home where not-so-well-known-to-the-outside world businesses (Dempsey's, DiFalco's, Hallie's and Acre and The Apple Box) deliver their services with spirit as great as anywhere in the world. Here is the longed for home, a town less populated than two of the high rise apartment buildings adjacent to my Hong Kong hotel. Home where ... well, you know, where "home" could be. I'm going home, in the larger sense yes, going home. So here's an invitation ... and if you respond ... it's meant for you. My long homecoming journey ... 41 years in the making ... begins with an offer for you to join me on February 7-11 at "The Ronin Huddle" - a retreat I crafted in 2002, then called "The Leaders' Retreat". The old name is no longer appropriate. People mistakenly thought the retreat was reserved for executives or business owners; but that simply wasn't the case. The retreat - The Huddle - is for anyone who decides to attend to their own wellbeing and engage in thoughtful practices of listening, dialogue, feeling and quiet; practices of integrating physical movement and nature - all for the purpose of serving what's important to their lives and their future. Though I'll be The Huddle's host and facilitator, I'll also be as much a dedicated student as everyone else. Our venue: Four Springs Retreat Center - in Middletown, California, an hour from my Northern California front door. Susan Hammond will also facilitate, bringing her strength and expertise as a Feldenkrais practitioner in service to us all. So at this point it's a wide open invitation - and there's room for only twenty. Do you want to come? Will you? Your fee (request details and information here) will cover your 4-evening stay, your meals, exceptional instruction, rich experiences and the joyfulness of time richly spent with wonderful people. Transportation to and from Four Spring is yours to handle. Winter is a good time for a respite. Winter is an important time for the ending of one thing and the beginning of another. Winter is a great time to begin a journey home. My Promise: Four days serving only what matters to your life. It was 2001. An evening MBA class at a University of San Francisco. I was invited to meet students who were scheduled to attend USF's first offering of The Samurai Game®. Over the next few years the simulation would become part of the university's MBA core leadership course, and also offered within a special USF for-credit retreat. But this night was simply introductory time. The professor needed time to cover the day's topic - The JoHari Window. Then, turning her attention to me for the night's remaining minutes, we went round the room so everyone could answer a question I requested in order to help me prepare for what I'd bring to them in a couple of weeks. "What are you gaining from your leadership studies here at USF?" A third of the way around the circle sat a student sprawled across his chair, feet out, head tossed back. Everything about him said, "I don't want to be here." His contribution started with a deep in breath and a sigh, and then, "Well leadership is an interesting topic. But I'm only getting my MBA so I can more marketable. I really don't care about leadership, and I don't' think it should be a required course in the MBA program. Why should I have to study it?" That was quite a poke. My "what are you gaining" question was sincere. I took the work seriously (still do). I wanted know how to serve each candidate and their professor, and the university's mission. I caught myself reacting. Then I paused so his question could hang in the air for a while. I recall thinking, "Well, at least he's being real." I was an outsider that night. No official standing within this system, just an invited guest. I found myself wondering if other barbed surprises lurked. Was this guy an anomaly? Was he voicing what others wanted to say but were unwilling, embarrassed or afraid to admit? Words like, "HEY, LET'S GET REAL ... I'M ONLY HERE AS A STEPPING STONE TO GET SOMEWHERE ELSE!" Today, 2015, we hear about this kind of thing all the time. It's nothing new. We read about Congressional representatives motivated to run for office with little thought given to serving a constituency; instead a lot of thought pointed at the lucrative business called being a lobbyist. For how many people has election into a government position become today's MBA? My next words just kind of walked into the room's silence. "I'm not certain I can do justice to your question, 'Why study leadership?.' But once you have your MBA degree and you've marketed yourself well, and you have that great job, ask the people working for you why you should have studied leadership. They'll probably have an answer. Thanks. Next?" Is it important that teachers (academic, religious, personal growth, coaches, etc.) and leaders (organizational, business, non-profit, military, political, etc.) who espouse ethics and moral codes and constructive behavior be ardent students and practitioners of those codes? As cliché as it sounds, it comes down to walking the talk. Do the messengers have a responsibility to be on paths consistent with their messages? And what of their products and services? IF your answer is, "Yes, it is important" – then how important is it, in other words, to what degree? And what to do about it? In 1989 at a meeting I was attending a company CEO spoke with an employee prior to his (the employee's) testimony as a witness in a trial. The employee was nervous about how his answers would be received. Attorneys representing the company told him to simply tell the truth. But concerned for how "the truth" might impact corporate image, the CEO said in the meeting, "I would never ask you to lie, but just tell the truth beautifully. Know that I mean?" I stopped doing business with that company and that CEO. The employee? He quit. The general field I've been engaged in for four decades involves experiential leadership seminars and workshops. Unfortunately this field has become quite industrialized, kind of "McDonald-ized". Forty-one years ago only a handful of organizations did this kind of work, and it was pretty rough stuff. Since that day a lot of improvements have been made. Along the way, in no small measure thanks to the internet and social media and some slick marketing, thousands of wannabe groups have sprung up. There are some sincere folks out there, but many of the groups are simply spin offs of spin offs started up by people unstudied and unpracticed in the messages they promote and the programs they facilitate. Rather than grappling with the messages (appealing and attractive) some of these owners and facilitators get fixated on financial reward, "the bottom line". Where are they when it comes to ethical or moral code they espouse? Here's a viewpoint – "bottom lines" have nothing to do with money. When all the money is gone, the bottom line is the guy or gal looking from the mirror… provided one has the moral courage to actually look into the mirror. The embodiment of an ideal takes time and effort and failure and falling off the wagon and getting back on the wagon and scraped knuckles and bruised ego and lost revenue and the willingness to look like a fool – and always being a new student every day. It's not that the upstarts who fashion the spinoffs shouldn't make the effort to spread the idealistic word or engage in idealistic work. But if the upstarts aren't interested in study and homework, in doing the "practice" of the ethical/moral codes they espouse enough to practice them, then they should seek a different path. Being financially rewarded or compensated for service is one thing. No argument there. That one sells something he or she doesn't believe in enough to commit the sincere practice of it - ESPECIALLY important when times get tough and the manure is hitting the ventilator – well then, at best this is an insult and at worst it's a satire that leads to decay and ultimately undermines trust. A few years ago, on my first visit to Poland, I spent a day at Auschwitz –its Polish name being Oświęcim – to understand and remember. This week I’m in Taiwan until May 31. I won’t get to be at the annual Memorial Day ceremony back home, so the plan is to visit WWII POW camps on NE side Formosa where LTG Jonathan Wainwright and others were held captive following the surrender at Corregidor. Yesterday I saw a FB posting commemorating Memorial Day. It was the image of an American flag superimposed with a shadow of a cross. It got me thinking that all who served need honoring, regardless of “brand” of belief and by what symbol their “brand” of belief is or was identified – including “brands” that some might label “lack of belief” or “non belief” or “not my belief”. Apparently they “believed” enough in each other (regardless of “brand”) to take care of what I get to enjoy. Tuesday’s memories will include my Dad, my brother, some relatives and close friends & classmates – and some recent acquaintances whose “brands” have been, at times, shunned, scoffed, mocked, jeered or otherwise marginalized. But they all served. Thursday night - a weekend event - forty years ago. Drawing attention to how habitualized people have become to distractions the speaker asked us to remove our watches and place them in a basket kept at the podium. Sure enough as the evening unfolded people caught themselves glancing at empty wrists as thoughts related to time entered their thinking. The simplicity of the exercise made it profound - at least for me. "How long have I been sitting here?" (a glance at my wrist). "I wonder what Charlotte's doing? (a glance at my wrist). "What time are we supposed to start tomorrow?" (a glance at my wrist) --- You get the picture. In short order the wristwatch thing drew awareness to the thoughts that otherwise I would not have realized were so frequent. That weekend was about accepting responsibility as an adult regarding my thoughts, and what these thoughts produce in my daily life, and who the people are who surround me, and what they really are about. No doubt staying on schedule is important - but it's not the only thing that's important. Saturday - a weekend event - one month ago. Drawing attention to how habitualized people are to distractions I asked folks to turn off their mobile phones during the program sessions I was conducting, and offered that they might soon begin to notice how much control their mobile phones have on behavior, mood and attitude. Then I suggested an experiment - for those who would be willing - put away the phone for two full days to see what functioning and communication and relationships would be like without a mobile phone. In other words, try to function without one for a while. The result? Lots of chuckles at first. Most people turned them off. A few put them on vibrate. Some made no effort at all. The rest of us knew who was who in as "blings" and "beeps" and "jazz" and "whistles" played out a Pavlovian sideshow. Every couple hours we took our bathroom breaks, and less frequently our meal breaks. Hands darted to the pocketed phones. Feet carrying bodies dashed across the room and jittering fingers scrambled for purses and brief cases nurturing the prized devices. Within seconds folks had them plastered against their ears - some had one at each ear. Interesting? Odd? Strange? Well maybe not - we see it all the time. Walk into any restaurant and count how many people are on their mobile phones, talking or texting or playing video games. We are a world distracted - and some would offer a world that is kept distracted. This is no small deal, in fact it's kind of scary. It's not a USA thing. It's not a China, Mexico, Russia thing. It's nearly everywhere, even in some of the most remote places on our planet. Consider watching that couple sitting across from you in the restaurant while they're on a (what could have been romantic) date, and one of them stops mid conversation as the vibration or the bling of a Samsung or iPhone demands (yes ... DEMANDS) attention. And with that, the device holder (it's actually sitting on the table next to the salad fork) says, "Excuse me a moment, will you?" - then answers and has a chat. Actions speak loudly. Doubtful you'd hear the following said with words, "I'm sorry (well maybe not really) but my device here is telling me something more important than you (at least it could be?) is happening right now, so I've got to put you (miss or mister human being) on pause a bit because (after all) you're in second place right now." Sad? Yes, but it's just been said with a body in action. The mobile phone (as with the wrist watch of forty years ago) isn't the issue. We are the issue ... or at least we could be and should be the issue. Our mental discipline. Our potential. Relating and connecting, even over seemingly mundane things that could be magnificent and terribly interesting when we slow enough to attend to them. There are lots of studies. But the studies will remain studies and our individual and collective human potential will remain unrealized potential as long as we don't act and practice something different. And then --> here as well. Sunday - the end of that weekend program - one month ago. A young man (we'll call him Gustavo) walks up with a big grin and says, "I've been living totally distracted, and I'm a really smart guy. I didn't used to be that way. But, more and more I've gotten caught up in technology to a point that it feels like I can't relax, like time is getting away from me, like I'm on a coffee high all the time. It's to a point that I'm taking medication to slow me down. Thanks for asking me to put away my mobile phone." Will it last for him? I don't know. I hope so.